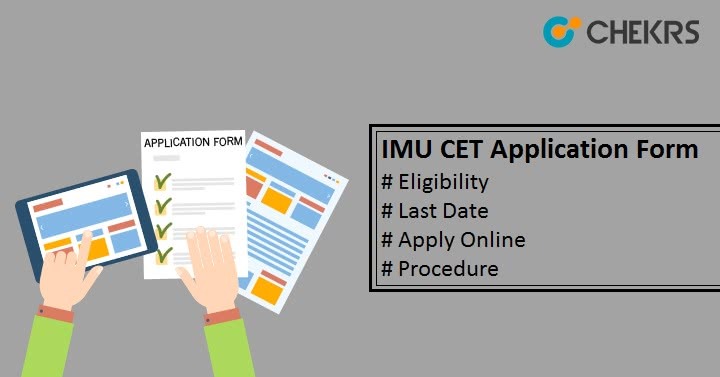 IMU CET 2019 Application Form: Indian Maritime University (IMU) conducts the IMU CET. It is a national level entrance exam. The Entrance exam is organized to provide admission into the undergraduate, postgraduate, research & postgraduate diploma courses in the field of marine. To Get the admission candidates have to Apply online on the official website. In this article we are providing all the information you will need to do IMU CET Registration and fill the form. You have to must know that IMU conducts CET for providing Admission into all courses except BBA. The Application form is expected to be available in the last week of March. IMU CET Registration Last Date will be in the 3rd week of May 2019, But for BBA the Last date will be in June 2019 1st week. 17 Years Minimum and 25 Years Maximum at the time of Admission. 5% Relaxation for SC/ST Category Students. Pass 10+2 or its equivalent with minimum 60% marks in PCM subjects & 50% marks in English subjects. Appearing Students can also apply. The IMU CET Registration 2019 will starts from the last week of March. The Application Form will be available through online mode only. Candidates have to upload recent Photograph, Signature and documents which are listed below. In the Registration, process candidates have to see three preferences for the exam cities. SC/ST/OBC (NCL) certificate (if applicable) etc. IMU CET Application Fee can be paid through online mode. In Online Mode candidates can pay the fee via Credit/Debit card, Net Banking. The Fee details are given below. As usual, we are providing step-by-step procedure to Apply Online for IMU CET 2019. And again the complete procedure can be divided into 4 parts. Find and click on “Apply Online for CET 2019” link. An instruction page will be visible, Read it carefully. Again Find and click on “Register” link. Fill all the asked details for registration. You will receive registration/confirmation mail on Email. Again visit the same page and log in with application number & password. After Login you will access the IPU CET Application Form. Fill all your personal, academic, communication, and 3 exam center choices, etc. Click on the “Save and Next” button. Arrange and edit all the scanned images as prescribed in the instruction. After proper editing uploads your scanned photograph, signature & other relevant documents. Click on Preview button and Check all the filled details and take a print out. After filling the form, Uploading images and rechecking all the details pay the IMU CET Application Fee. After a successful fee payment, click on the “submit” button. Take a Print-Out of filled IMU CET 2019 Application Form and Fee Receipt.